Knights start season with 6-3 record. Miles Amos ’19 attempts a free throw against Sacred Heart Prep Atherton in the Burlingame Lions Club Tournament. Amos tied a tournament record with 13 made free throws in the contest. The Knights’ varsity basketball team has yet to hit their stride this season, coming up short of two tournament wins in back-to-back weeks. 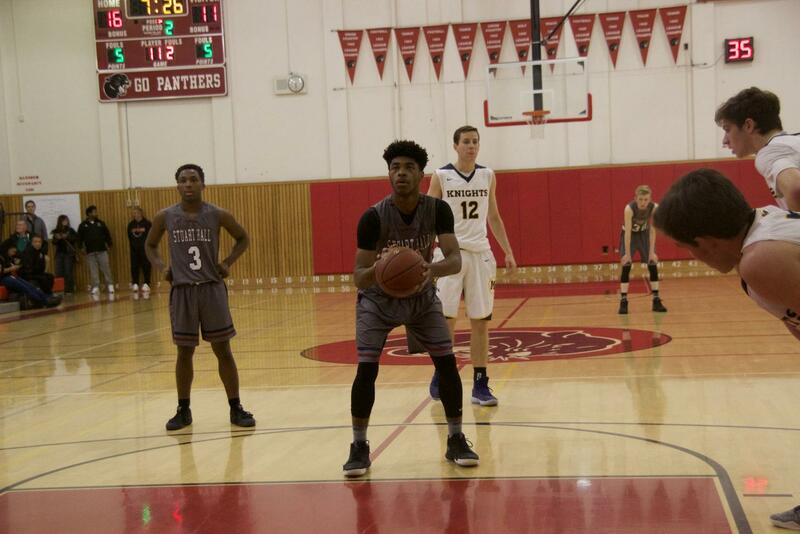 At the tournament in Burlingame last weekend, the Knights fell to Menlo School 64-49 in the first round. Automatically knocking themselves out of contention in the single-elimination tournament. “I felt like we got a real good look at some good teams [in Burlingame],” guard and team captain Jorim Powell ‘18 said. matchup of the day against Half Moon Bay, a strong offensive performance in the first quarter put the Knights up 16-13. Despite that, the team was only able to muster seven points to the Cougars’ 20 in the second quarter and was unable to recover, losing 62-49. This is the second tournament loss of the season, as the Knights came up short in the Redwood Classic on Dec. 2, though performed much better. The Knights took the long bus ride up to Boonville, California in Mendocino County for the first tournament of the season. In their first three games, the Knights stomped their opponents.They defeated Tulelake 66-31; they beat Fort Bragg 85-33 and won against Argonaut 84-43. “The wins in Boonville felt really good for all of us,” Powell said. Doubling their opponents scores in each successive game, the Knights felt confident facing local opponent, Branson, in the final. The Knights kept the early Branson lead within five points by the end of the first half, but the overpowering center for Branson, Viktor Rajkovic, was able to score 36 points and bring down 17 rebounds. The Knights fell 63-49 to the still-undefeated Bulls, but the Knights are not the type to dwell in the past. The Knights’ season has hardly begun, though, and despite tournament losses, the Knights hold a 6-3 record. Early wins against both Lowell and Miramonte showed more promising results of Knights basketball. The team is currently playing in the Damian Lillard Classic at Oakland High School but is set to return back to The Hall for their next home game against Archbishop Riordan on Dec. 21 at 6 p.m.